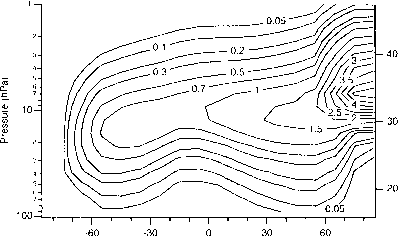 Figure 4.20 Contours of zonally averaged daytime HNO, abundance (ppbv) for December 1992. Data are from the UARS Rcfcrence Atmosphere Project (W. J. Rande), personal communication, 1998). 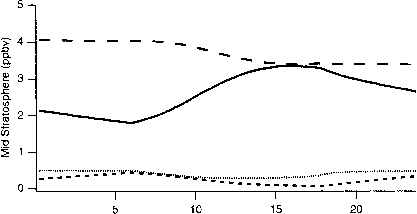 Figure 4.21 Contours of daytime-average N,Os abundance (ppbv) for December. Values are from the Goddard two-dimensional climatological circulation model |73|. Based on a model run to steady state using N O emission levels for 1990.
which is a significant loss pathway for NO,, in the upper stratosphere . The Clv distribution, in contrast, does not show a similar decrease because there is no comparable loss pathway for CI,. The abundance of NO, (Figure 4.19) increases with altitude throughout most of the stratosphere due to increases in both the abundance of NO,, and the ratio of [NO,]/[NOJ with altitude. 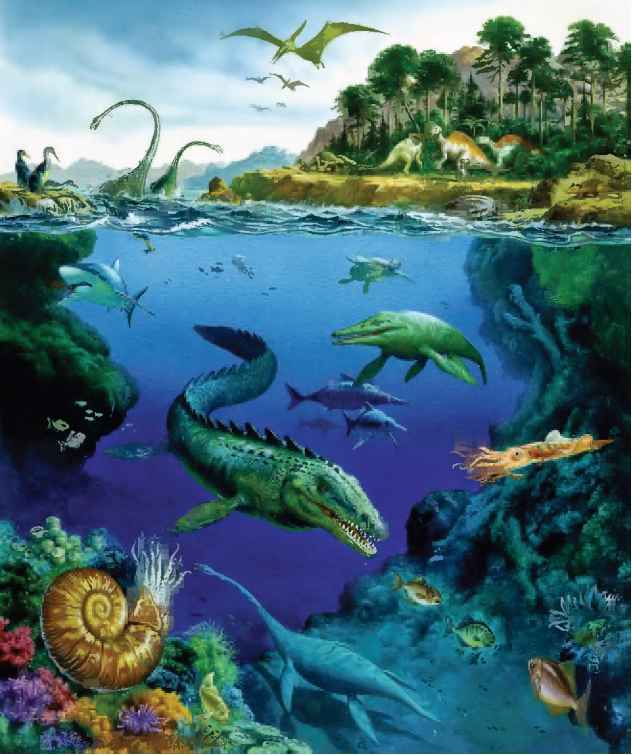 The increase of the ratio of [NO,]/[NO,] with altitude results from an increase in the formation rate of NO, from NO, reservoir species (typically from photolysis reactions) relative to the loss rate of NO, to form NO, reservoir species (typically through three-body reactions). In the upper stratosphere. NO,, is composed almost entirely of NO„ so the decrease in NO,, in the upper stratosphere is mirrored by a similar decrease in NO,. Note that in the polar night region the abundance of NO, is low because, in the absence of photolysis, the reaction between NO, and NO, to form N20, depletes NO,. 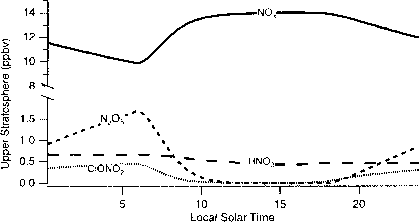 Figure 4.22 Diurnal cycle of the major components of NO, derived from a model incorporating the reaction set of JPL 94 [911. The model run is at 45°N on March 21, 1996 and using background aerosol abundances; "upper stratosphere" is from the 3.16 hPa level of tile model, "mid stratosphere" is 14.7 hPa, and "lower stratosphere" is 57.0 hPa. increases with altitude. Second, the abundance of NO, increases with altitude in the stratosphere. In the lower stratosphere, the abundance of NO, increases faster than the ratios !HNO,]/[NOJ and [N,Os]/[NOv] decrease. As a result, the abundances of HNO, and N20, increase with altitude in the lower stratosphere. In the mid- and upper stratosphere, the decrease in the ratios [H,\T),)/|NO, ] and [N,Os]/[NOv| dominates the changes in NO, with altitude, leading to an overall decrease in the abundances of HNO, and N,Q,. Both HNO, and N,Os also display strong latitudinal gradients, with their abundances increasing as one moves from the summer pole to the winter pole. As discussed previously, N,Os is formed at night and destroyed during the day. In the summer polar region, which experiences 24 h of sunlight every day, the N,Os formation rate is approximately zero, so the steady-state abundance of N,Os is close to zero. In the winter polar region, which experiences 24 h of darkness every day, the photolysis of N205 ceases, and the abundance of N,0, can build up to several parts per billion by volume. In between these two extremes, the average abundance of N205 is a function of the length of night. HNO, is formed both during the day (reaction (4.42)) and at night (reaction (4.48)). In the winter hemisphere, photolysis rates are low and the lifetime of HNO, is long. Continued production of HNO, in this region from NX), hydrolysis therefore leads to a build-up of HNO, in the winter hemisphere. Typical diurnal cycles of the components of NO, are shown in Figure 4.22. Because the lifetime of NOv is comparable to or longer than a day throughout the stratosphere (see Figure 4.13), instantaneous production and loss of NO, will, in general, not balance. Instead, during the day, there is a net production of NO, and a net loss of NO, reservoirs. At night, the reverse occurs: there is a net loss of NO, and a net production of NO, reservoir. But the system is in diurnal steady state, so that over 24 h, production and loss of the constituents of NOy will approximately balance . RrONO , is not shown because its abundance is so small (a few parts per trillion by volume). This net increase in NO, is accompanied by an equal net production of Clt between sunrise and sunset. At sunset, the abundance of CI, is nonzero, and the reaction between CIO and N02 to reform ClONO, is a net night-time sink of NO,. The magnitude of this night-time sink of NO, is approximately equal to the daytime source of NO, from ClONO, destruction. As a result, the net decrease in ClONO, during the day is balanced by production at night, so over 24 h the net change in ClONO, abundance is approximately zero. Figure 4.23 plots the contributions of ClONO, chemistry to NO, production during the day and NO, loss during the night. At all altitudes, the source and sink due to ClONO, are a few percent of the total source and sink of NO,.